What do you teach first, the Approach or the Armswing? The reason I bring up this question in an article about the skill of attacking is to ponder the question as to whether you believe the approach or the armswing is more important, or maybe you feel that they are equally important in becoming an efficient and consistent attacker. If you are in the camp that believes teaching the armswing takes precedence over teaching the approach, when should the approach be introduced into the process? The ages and experience level of your players would seem to have an obvious impact on your answer and decision as to the proper proficiency level desired before adding approach footwork. What are the advantages or disadvantages to doing approach repetitions with an inefficient armswing? What are the long term ramifications versus the short term benefits? How does learning and muscle memory habits factor into the equation? Based upon a purely subjective observation and analysis of attackers at all age groups, could there possibly be more repetitions spent trying to get our players to develop a more efficient and consistent standing topspin down ball before progressing exclusively to full approach and armswing repetitions. This may be contrary to the “Whole” versus “Part” teaching advocates out there, but we will leave this discussion for another day! Exhibit one of attempting to answer this dilemma would be watching the control, or lack of control, of players peppering while they are warming up. Do they exhibit armswing mechanics which promote some form of body and shoulder rotation with a contact that controls the intended direction of the ball by imparting at least some minimal amount of topspin onto the ball? Do they spend more time chasing the ball or controlling the ball? Exhibit two would be trying to watch “non-beginner” players struggling with trying to keep a down-ball in the court without hitting a floater that travels ten feet out of bounds or goes under the net in a match situation. For the coaches and players reading this article that play other sports, there are many different ways to swing a baseball bat, grip and swing a golf club or tennis racket, and hold and shoot a basketball, just to name a few examples. In my research for this Critical Analysis of Volleyball Skills Series, the one constant in the analysis is that there are nuances in every skill within the players being studied and analyzed. 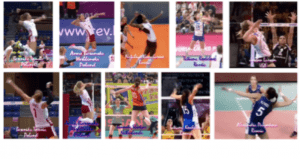 In every Critical Analysis of Volleyball Skills Article I have written, I have attempted to identify the most common elements of the skill that is performed by a majority of the players observed and analyzed from around the world that have represented their respective National and Olympic Teams. Once the common denominators are identified, they become specific training keys I attempt to incorporate into the training regimen for the skill. The higher the percentage of players that are observed to perform a common element, the more important that element becomes for me to stress in the training process. A video clip of Russia Opposite Ekaterina Gamova shows her down-ball armswing technique while warming up with a teammate. 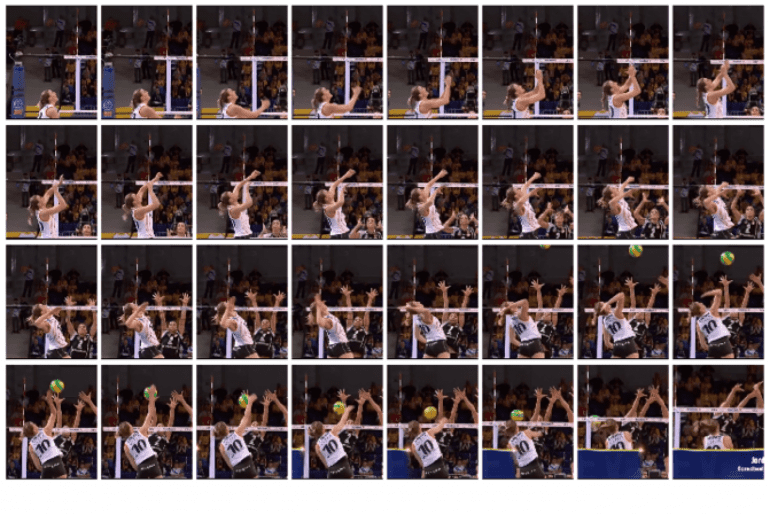 A photo sequence of Gamova’s down-ball armswing is presented for your review and analysis. 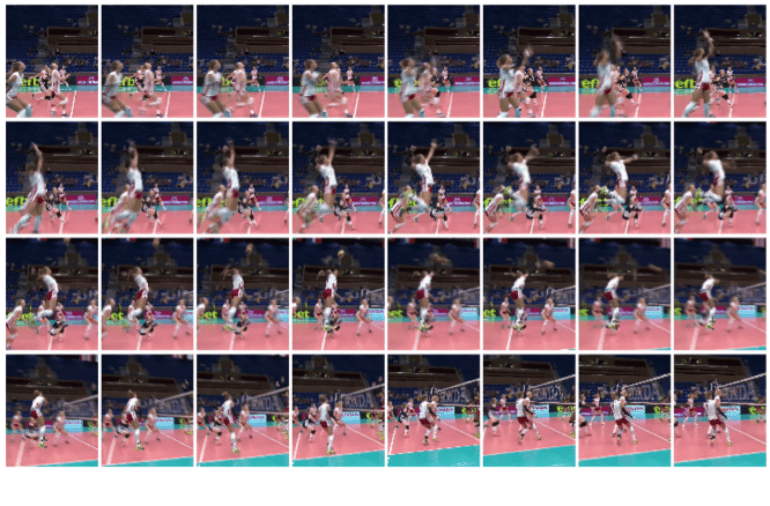 Some common components that I have observed in comparing Gamova’s video and photo sequence collage to other player’s armswings are summarized in the order of occurrence while performing her down-ball armswing technique. The first important component is a subtle movement to the right getting her hitting shoulder under the ball (Row 1 - Frames 1 through 4). Common element number two for hitting a down-ball is the lifting of the arms and a rotation of the upper body where the left shoulder points toward the intended target (Row 1 - Frame 5 through Row 2 - Frame 5). The third and most common element detected among all players observed and analyzed, making it possibly the most important position in the armswing is what I will refer to as the Armswing “Load” Position. This position is reached when the elbow is pulled back and is no longer moving downward or upward before the elbow begins traveling upward to lead the arm toward contact with the ball. This Load Position is being isolated in the armswing to emphasize its importance as a common component and will be demonstrated later in the article comparing various international player’s armswing technique. Once the Load Position is reached, the elbow begins to travel forward and pointing upward toward the set ball. In the photo sequence, you can begin to see the upper body begin to rotate around with the right shoulder catching up with the left shoulder on contact with the ball. You can see this rotation by watching how the number 11 on Gamova’s back becomes more visible up to the hit. The follow-through has a natural flow and deceleration where the right shoulder travels slightly beyond the left non-hitting shoulder. Determining the level of proficiency necessary before introducing the approach and footplant is another subjective consideration. Once the decision is made to incorporate the approach jump, are the common components of the armswing different from the down-ball armswing mechanics? This article will focus on the armswing as the attacker begins to leave the ground and is in the air. The Approach and Footplant for the attack armswing will be analyzed in a future Critical Analysis of Attacking article. The next video clip shows the armswing of Berenika Tomsia of Poland for an Analysis. I have elected to use Tomsia as a primary example of Armswing Technique because she has exhibited all of the core common components that I have discerned in comparing a multitude of International Players’ Armswings. The following three Photo Sequences of Berenika Tomsia represent the three views shown in the video clip above. The first and most obvious difference between the down-ball attack and the jump attack is how the arms are used to reach the Armswing Load Position. In the down-ball attack, the arms are lifted and rotated to the Load Position. 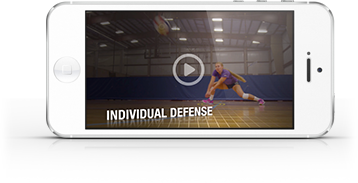 In the approach attack, the arms are thrown in a backwards reach motion before thrusting them forward and upward to generate a vertical jump upwards towards the set ball. The Load Position is reached while Tomsia is still moving upwards in the air. 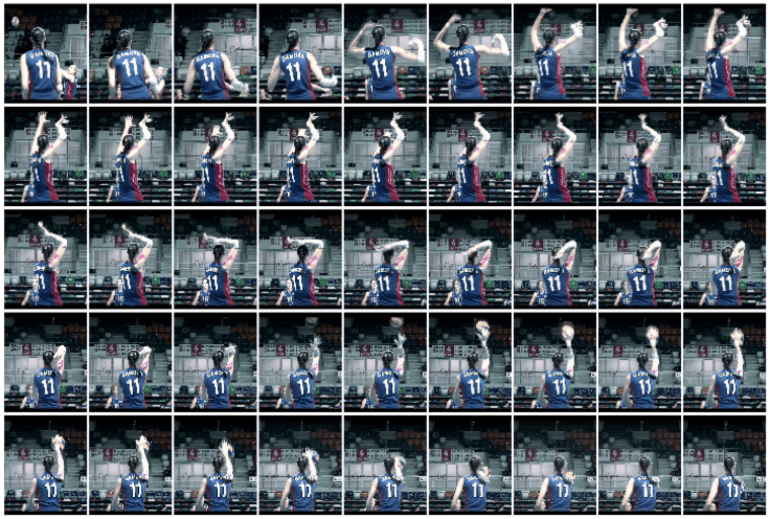 In the third side view photo sequence above, you can see this Loading movement begin in Row 2 – Frame 7 until the Armswing Load Posture is reached in Row 3 – Frame 3. The three photo sequences of Berenika Tomsia details the mechanics of the upward elbow point and shoulder rotation up through the ball contact. 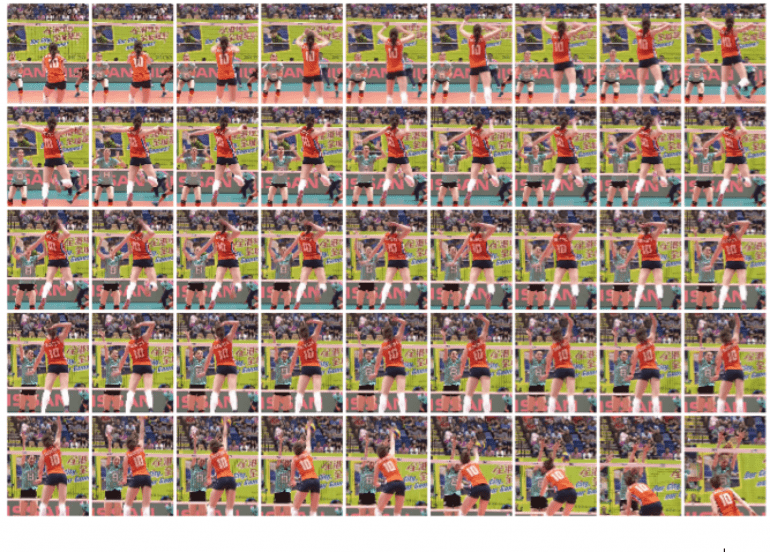 The Tomsia video and the accompanying photo sequence above shows the balanced follow through and two foot landing which should be promoted and encouraged. The Armswing Load Position is demonstrated below comparing a variety of International Players’ armswings. 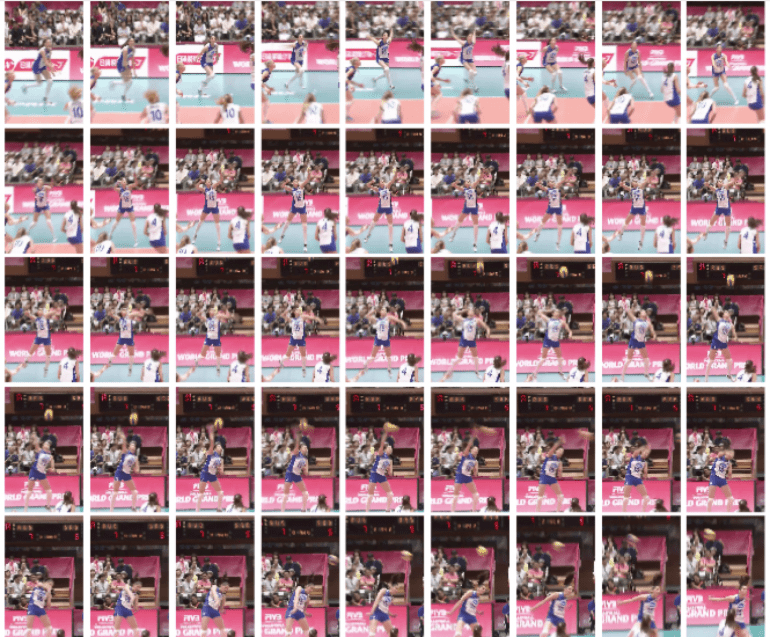 The photo collage shows Berenika Tomsia of Poland, Anna Baranska Werblinska of Poland, Nataliya Goncharova of Russia, Lonneke Sloetjes of the Netherlands, Tatiana Kosheleva of Russia, Jordan Larson of the USA, and Alexandra Pasynkova of Russia. Based upon your observation and analysis of the Armswing Load Positon Comparison Analysis photos, have you formed any specific conclusions about how this would influence armswing technique? There are some nuances to the Armswing Load Positions among the hitters in the photo comparison such as the height of the elbows in relation to the hitting shoulder, and the angles of the upper and lower arms. Generally speaking, there appears to be somewhat more similarities than differences in their Load Positions. If you feel they have comparability at the Load Position, the armswing mechanics used to arrive at these positions reveal some distinct differences on how they ultimately established them technically. Berenika Tomsia drives her arms upward in a more vertical direction with both arms in front of her face before the elbow is pulled back toward the Armswing Load Position. She has a looser or wider angle between her upper and lower arms than many of the other players observed. Anna Baranska Werblinska has what I would describe as the traditional bow and arrow armswing which might be the most prevalent technique taught by coaches. It is probably the most widely used armswing technique used in the men’s game. The hitting arm is raised in a more horizontal position to approximately shoulder level away from the body while the left arm is raised considerably higher than the right arm in a more vertical direction. The right elbow is pulled backward in a flatter trajectory to the Armswing Load Position. The technique used by Nataliya Goncharova more closely resembles the armswing of Berenika Tomsia. The major difference between how they arrive at a somewhat similar Load Position is the Goncharova utilizes a Goofy Footed Approach. Instead of the traditional left-right-left footwork pattern, Goncharova uses a right-left-right footwork sequence. The other difference would be that her elbow is driven higher vertically near the top of her head before the elbow pull to the Armswing Load Position. Lonneke Sloetjes utilizes a bow and arrow type armswing which more closely resembles Anna Baranska Werblinska. The nuance in Sloetjes’ armswing is what I refer to as a little flip where the hand drops below the elbow (Row 1 – Frame 9). After the flip, there is a quick elbow pull to the Armswing Load Position. There is less of a shoulder turn in this Pipe Set than was observed in her Red Set attack. The initial phase of Tatiana Kosheleva’s armswing is similar to Berenika Tomsia of Poland. Both arms are brought up more vertically than in the pure bow and arrow technique. The nuance in Kosheleva’s armswing compared to Tomsia’s is that Kosheleva adds a little flip in her swing before reaching the Armswing Load Position. Jordan Larson’s armswing appears to be a combination of the way Tatiana Kosheleva brings her arms up and is similar to Lonneke Sloetjes of the Netherlands by adding an even more pronounced flip before reaching the Armswing Load Position. Because of the larger flip, Larson has a more abbreviated elbow pull backward before reaching her Load Position. Alexandra Pasynkova has the most unique way of getting to her Armswing Load Position among the players analyzed. Pasynkova’s left arm is fairly similar to all of the other attackers observed. Focusing on her right arm, she uses more of a lifting motion from her right hip similar to Ekaterina Gamova’s topspin down-ball armswing motion. Yet, when you compare her Armswing Load Position with the other attackers, Pasynkova is able to achieve a similar result. As this article has evolved to a focus on the common element of the Armswing Load Position, it has been observed to be the element that is replicated by the highest percentage of accomplished players at all levels of play over my twenty-five years of observation and analysis of armswing technique. It appears that how this position is achieved is not as critical as actually replicating a somewhat similar Armswing Load Position. The one major caveat I have detected at levels below the National Team players around the world is that there are many players who have complicated, inefficient and slow armswings that can achieve a similar Armswing Load Position but they get to this position late in their approach jump and contact the ball on the way down far below to top of their jump attack reach. In this scenario, the player would need to either simplify their armswing motion, begin their armswing sooner in the jumping process, speed up their armswing, or jump higher to give them more time to complete their armswing mecanics to allow for a contact of the ball at the top of their jump. Are you seeing these Armswing Load Positions in your players? This article has covered just a small percentage of the entire approach and armswing motion. The other common elements of attacking will be analyzed in subsequent articles in this series.